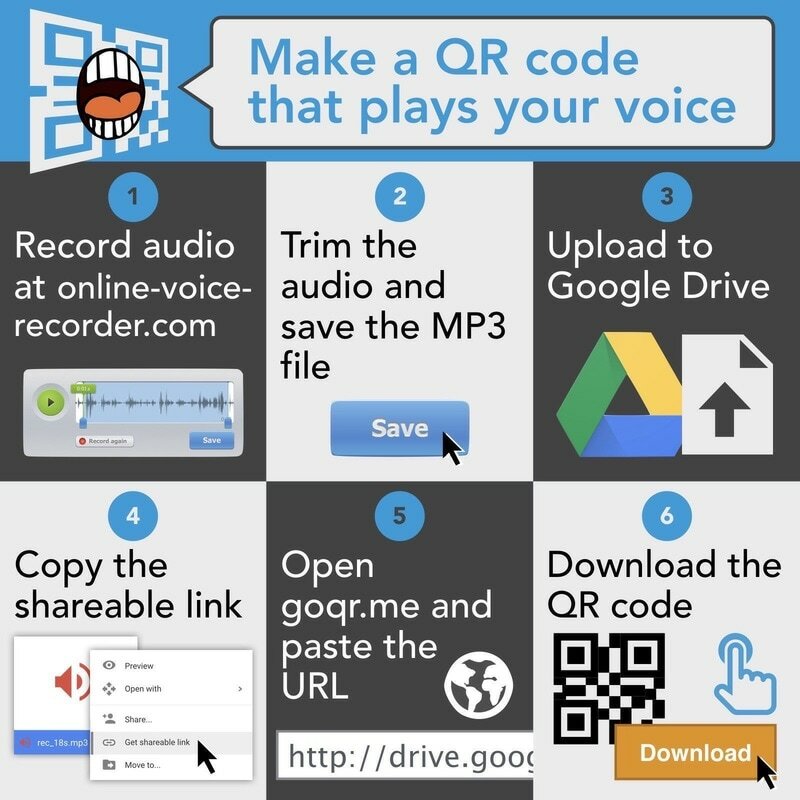 Quick response (QR) codes are easy to create and have many uses in the classroom. With the posting of a QR code, you can lead students to information by just using their computer's or mobile device's camera. This page provides links to QR code readers and creators and tons of ideas for their use in the classroom! of how to make a "talking" QR code! My kindergarten students dictate stories/sentences they have written into my phone. I then create QR codes for them and display them in the classroom. I also did QR codes for Kindergarten Parent Orientation. My students were recorded as they talked about different areas of the classroom. QR codes with this information was put around the room at the corresponding area/center (kind of like a museum audio tour). I have put QR codes inside books to send student to reviews of the book. I have a code to send student to State Award site for our state books. I have a QR code outside my computer lab that lists Tech standards for parents when they visit during open house. At Daily 5/our reading workshop, students scanned codes, read a sentence, then chose a spelling word that correctly completes the sentence. We also use QR codes to provide research links in a safe way. My digital art students have QR codes displayed with their artwork that connects to a digital slideshow of all of their projects. Also a QR code linking to new processes we have learned like missive or printmaking for General Art classes. Scan a QR code to hear a book talk done by one of the teachers. I have used them to liven up bulletin boards, give parents my business card and provide a link to a slide show. The students competed in an Amazing Race type game. The students used iPods to scan QR codes posted around our middle school campus. Each code was a review question (for their upcoming final exam) and a hint to the location of the next QR code. Every 4th QR code was a constructed response challenge. The groups could not move on to the next QR code until the challenge was correct. The students loved it...and their test scores were higher than years past. A QR code tree for parents with codes to all the important links of the school! They created a Wordle on an explorer to display and then created a QR to with the explorer's picture. Use an iPhone, iPad or iPod Touch to scan student QR code cards and keep track of attendance. Reports can then be reviewed and exported online. I recorded students reading biographies that they wrote. The QR code linked to that video. I'm going to use a code that gives directions to a Mix & Match activity to generate random groups, and I'm going to use it first at pre-planning with my teaching staff! I have added QR Codes to student homework which link to video tutorials to help students if they are stuck on the problems. Created an interactive art show. Video scavenger hunt in audio video production Codes on books in school library that direct students to an audio review of the book. Audio created by audio video production class. I am yearbook advisor and last year we created a yearbook that was filled with QR codes that linked to videos on our YouTube channel and also to various sites on the Internet. Get kids to correct website or web resource for lesson (placed QR code on top of work page). We have 1:1 iPads... It's the easiest way to get everyone to right place at same time: scan and go! Linking up a timeline on the classroom wall to a student created wiki.